2015 is about done. What better time than now, on this last day of a year filled with ups and downs, to take a look back at all that happened. And what better way than to just grab the photos. Work in progress at the first of the year was my hard crime novel, A BLACK WATER SEASON. It went on submission in February. Abigail, (a.k.a.) Miss Priss was born a month premature on February, 8th. March roared in and my father passed. Who knew that Christmas 2014 would be his last? It all became very real when the contract arrived from my agent. And even more real when I received the first part of an advance! Spring came late, even though we may not remember it now, it took a while to warm up to our usual temperatures. And during the Spring, I began work on a new book, working title THE ROAD TO BITTERSWEET. In the late Spring, came my FIRST EVER edited pages from my editor. Yes, red pencil marks and all. It’s considered work, but I loved it. We took our usual trip to the mountains in the RV, and I got some more writing done and filled the days with long walks where I found this little guy who’s become the header pic on the blog here. Before I knew it, late summer arrived, and Mom turned 79. Here she is with Miss Priss on our back porch. When I look at her eyes, I see the sadness in them, even though she’s smiling. Fall came and my first ever writer’s conference, Bouchercon! Even though this conference was more in line with the genre of mystery/crime novels, (signed up while I was writing BLACK WATER) I still enjoyed every second, and most of all, meeting some of the folks I interact with on other blogs, like Colin Smith, and the notorious shark herself, Janet Reid! I swear I looked out the window one day and this happened almost over night. Thanksgiving was hosted at our house, and in what has become a tradition for me, I had Christmas decorations up too! And “Mister” offered up his contributions to the festive events! It’s hard to believe, isn’t it? Here’s to the New Year, and may it be filled with all you wish for! It’s the end of December and along with the rest of you, I’ve begun to reflect on 2014. The good, bad, forgettable, memorable, sad, and joyful moments experienced. Much like on the news, I’m busy recounting what I’ve accomplished, what fell by the wayside, and what 2015 will bring. I’ve already come to one, easy conclusion. I will not make a large pronouncement (here, or otherwise) involving the dreaded, sure to fail, or at least sputter for a while, then fail, New Year’s Resolution. Doing so seems so yesterday. No matter what’s happened or not, as another year comes to a close, it’s always a bit melancholy because we’ll never have it back again. Each day, hour, minute, and second is one of a kind, here once, and never again. Without dipping too far into what could start to sound like a drippy lament of time gone by, ala Auld Lang Syne, maybe we can just say, consummatum est. And with THE END in mind, what I’d really like is for this new year to be a year of discovery. What I mean is that I want go into 2015 without any preconceived notions or mandates about what it will be, can be, or should be. I’d rather be wide eyed with wonder, and uncertainty about what it might bring. For instance, I’m excited to see what might happen with the new project which has been on a low simmer as I’ve thought about possible plot lines. I think I have one particular piece of it solidified, but I won’t really know until I start writing. The rest of it is, as of now, an unknown. We could call that something of a discovery. Also, I’m still on the hunt for deeper thematic relevance, the character’s voices, and development. Even more than that, I’m searching for the something buried I don’t yet know, a part of the story still tucked away. Personally, I think it’s more interesting to enter a new year this way instead of declaring what we will or won’t do, which always seems to lead to disappointments and a feeling of failure. Like uncovering some part of ourselves unexpectedly. Recently, Writer’s Digest published an article about the three ways of introducing your main character. It was written by Les Edgerton, and he used a paragraph from the novel by Nick Hornby, HOW TO BE GOOD, where the main character uncovers something about her persona, a trait she’d never considered a part of her mental psyche. You can read the overall article about character intro’s as well as the example paragraph from the book here. This is not to say I hope to discover I suddenly want a divorce this year, as the example paragraph shows. Nor does it mean I hope to land on some negative family trait that only manifests itself after an eggnog overload. 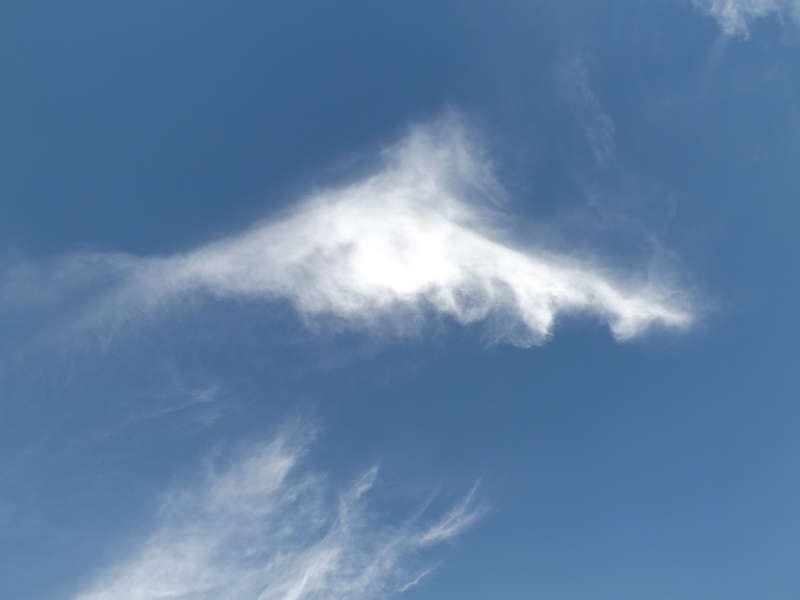 Obviously I’m only hoping for positive discoveries, something pleasantly surprising, like walking outside, looking up and suddenly witnessing the unique formation of a cloud. Whether these discoveries are related to writing, or otherwise, l think it would be great to know that we still have something new to learn. Don’t you? What do you hope to discover this year?